Exhibition hours are Monday through Friday from 10 a.m. to 5 p.m., and Saturdays and Sundays from 1 p.m. to 5 p.m. The exhibition features work by Charles S. Anderson and Laurie DeMartino in collaboration with French Paper Company. 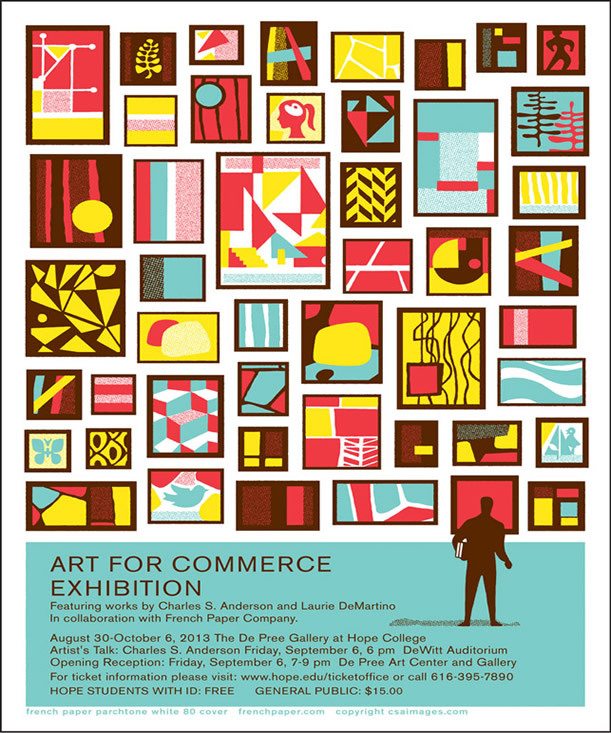 “Art for Commerce” portrays graphic design as a viable art form beyond its origins in marketing and communications. In 1989, Charles S. Anderson Design was founded with a single client—The French Paper Company in Niles,Mich. While the firm has worked with many clients since, their partnership with French Paper has endured as one of the longest-running, most prolific and internationally recognized client/designer relationships in the history of graphic design. Coupled with the world-renowned design of Laurie DeMartino, this exhibition pays tribute to this long-standing collaboration between French Paper and the artistry that covers its promotional pieces. Charles S. Anderson Design Company’s work has been exhibited in museums worldwide, including The Permanent Collection of The Museum of Modern Art, New York; The Nouveau Salon des Cent—Centre Pompidou, Paris; The Smithsonian Institution’s Cooper-Hewitt National Design Museum, New York; The Institute of Contemporary Arts, London; The Library of Congress Permanent Collection, Washington, D.C.; The Museum Für Gestaltung, Zürich; The Museum Für Kunst und Gewerbe, Hamburg; The Bibliothèquenationale de France, Paris; The Museum of Modern Art, Hiroshima; and The Museum of Contemporary Art, Shanghai. The firm’s work has also been featured in numerous prominent publications including “The New York Times,” “In Style,” “Dwell,” “Fortune,” “Rolling Stone,” “Esquire,” “Time,” “Forbes,” “Entertainment Weekly,” “Newsweek,” “Vanity Fair,” “GQ,” “The LA Times” and “ReadyMade,” among others. CSA Design has been awarded top honors in every major design competition, including multiple gold pencils from The One Show, and multiple gold and silver awards from the New York Art Directors Club.